I have for several years now been propagating some of Scotland’s old pear varieties. Between Perth and Dundee there are still a few very old orchards with big productive old trees, perhaps 200 years old, many hollowed out, and each year more of them blow over. The race to save these varieties has never been more important. One way of doing this is to propagate by grafting. This involves taking a healthy twig off the tree and grafting it onto a specially grown pear rootstock. I have been working with The Heritage Pear Project nationwide, a group of volunteers attempting to improve their pear dentification skills, and going out into orchards locating and propagating those unknown or rare varieties. Contrary to popular belief, these pear trees produce tonnes of fruit, unlike many of the dwarf modern varieties planted in our back gardens today. In the Carse of Gowrie, I have been particularly interested to propagate those trees identified as unknown in a DNA survey carried out by the University of Reading for Perth and Kinross Countryside Trust. This survey pulled out some unusual varieties such as Windsor, Chaumontel, and Laxton’s Superb ( yes I thought this was an Apple only!). More predictable was the regular occurence of Hessle, Craig’s Favourite ( a Perth variety ), and Green Pear of Yair from the Borders. The well known Conference was found at Ballendean, together with Buerre D’Amanlis, plus Catillac, a large triploid cooking pear and Swan’s Egg at Megginch Catsle. All very interesting, but equally so, around a quarter of those tested proved to have no matching trees at the National Collection in Kent. Which means they they could be seedlings bred by local fruit growers such as Patrick Mathew over hundred years ago, or perhaps simply a named variety from Belgium or France not represented in the Kent collection. So, over the last few years I have been propagating a few of these un-named trees before they collapse and are lost for ever. Occassionally we have some spare to sell, they may not be named, but simply have a number! 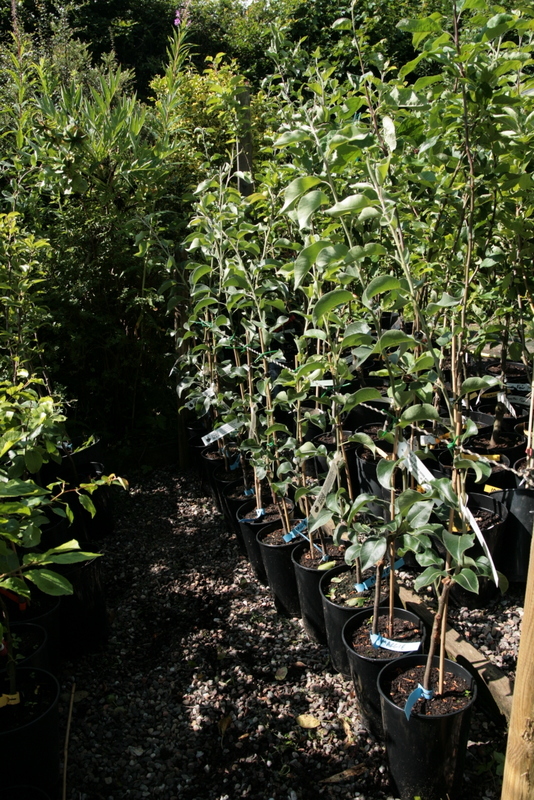 If you have a big garden and space for a big pear tree do please get in touch and help us save these varieties!